I tried snowboarding many years ago. I had already gotten the basics of skiing down but a lot of the people in the group I was going on trips with were snowboarders and I wanted to be one of the cool kids. That desire to learn how to snowboard lasted about 2 hours with me in a constant face-plant into the snow. I figure I must have done close to 200 push-ups that morning and afternoon getting back up off the ground. I wasn't a great skier by any means but I was certainly a lot better at that than snowboarding. It was just so frustrating not getting the hang of it especially when I had an alternative available that I knew how to have fun with. That day reminds me a lot of my experience with Sonic Free Riders with Kinetic on the Xbox 360. The idea of Free Riders, much like the idea I had to learn snowboarding, sounded good on paper and in thought. 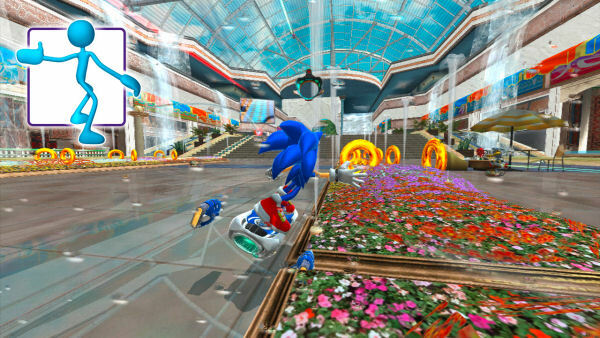 Create a game with the speedy Sonic on a hoverboard looking device and base the controls on the Kinetic. It would be easily accessible to the whole family because all you would need to do was to move from side-to-side and jump every now and again. What could go wrong? More than I was expecting that's for sure. But first, Free Riders has a story of sorts. It has something to do with...you know what? Who cares what the story is about. I've never played a racing game for the story mode and I can't imagine many that have. So let's just skip that part. I will say that many character from the Sonic universe are here and well as the famous golden rings. But really this is all about some high-speed, futuristic, Back to the Future, hoverboard action so let's get into that shall we. The famous motto in real estate is “location, location, location”. In a racing game it's “control, control, control”, or at least it should be. Anything interesting that Free Riders has going for it, and there are some neat ideas going on, is more than negated by the frustration of the controls. Free Riders was a launch title for Kinetic so maybe the developers rushed to get it out the door. Whatever the reason the controls are what will ultimately drive you crazy. The basic idea in Free Rider is that you are on a hoverboard device and racing around crazy tracks with others, trying to win the race. There are a variety of power-up, shortcuts, and jumps. One of my favorite power-up is the Coke can (really just a generic soda can, but I'm from the South so it will always be a Coke can to me) that you shake until it's ready to burst and then you ride that for a quick boost. There are many shortcuts on the tracks and I have always liked that in racing games as it tends to reward you for being adventurous. I also liked the graphics that were a bit on the simple side but were still able to look fun and each track had some nice atmosphere. Being a Kinect game naturally means no physical controller and, as I said before, this seemed like the perfect game for that. You control your rider by standing in front of the you screen like you were standing on a skateboard. That means you are kind of facing the screen a little sideways with one of your shoulders actually facing directly to the screen. Your feet are also a bit sideways in relation to the screen. You turn your board by either leaning forward or backward; depending on which foot is closer to the screen dictates whether learning forward turns you left or right. Oddly enough this feels pretty natural and makes sense. So certainly Sega had the right idea going in. But then it all falls apart. Free Riders is a terribly frustrating experience. As you are cruising down the tracks and try to turn you can find yourself learning about as far as humanly possible without toppling over yet your character continues to go straight. A moment later your shirt can sway and your character can go flying toward the side of the track like he's being sucker over there by a super Dyson vacuum. The jumping sensor rarely seems to accept what you really did jump and you can just forget about trying to do tricks which require you to jump in a circle. Sonic Free Riders is a good concept and had the potential to be a very fun game. But with a control scheme that is on the verge of unusable and is possibly psychotic it is really best avoid this ride. Maybe if they make a sequel and do some serious work on the controls we can talk but until that happens just go back and play Kinetic Adventures or Dance Central for your Kinetic fix. Final Rating: 48%. 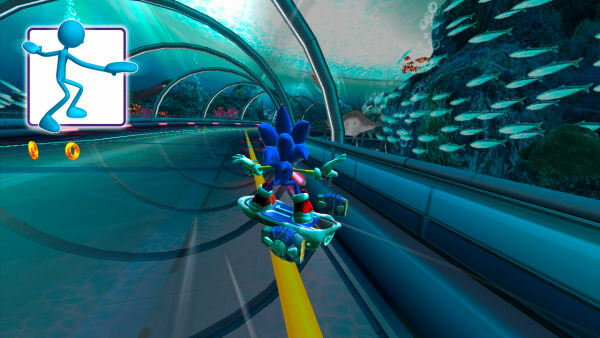 Sonic Free Riders could have been a great game if the controls worked.